Over the hill, I think – sadly. 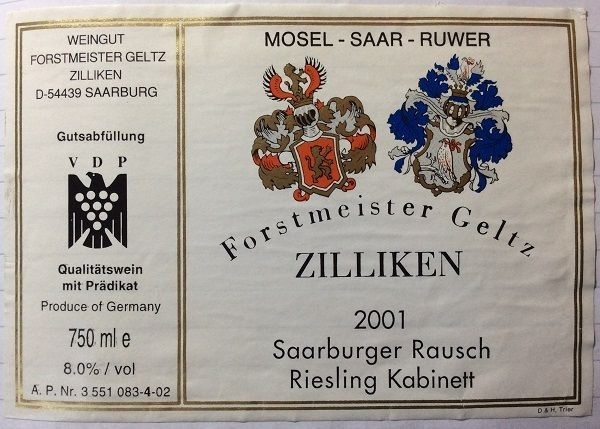 I’d heard good things about Zilliken as perhaps the Saar producer, but ultimately this didn’t reflect that due to age. It was just losing fruit and flavour concentration, so that I ended up getting bored halfway through, and not finishing the bottle. Pale gold. Intense lime, yeast, lemon sherbet and stony minerality, with hints of kerosene. Dies a bit in the glass. Medium-dry. Medium to high acidity. Lime and sweet apples. Slightly flinty, smoky mineral finish. Medium length, which shortens over time. Sweetness comes across as quite sugary – as if the fruit flavour has faded, to leave just sugar. Let’s see what the second bottle is like.